Today Gerty and I set out for our first real ride. My bike is in its run in period so nothing to hard. So We went chasing daisies. 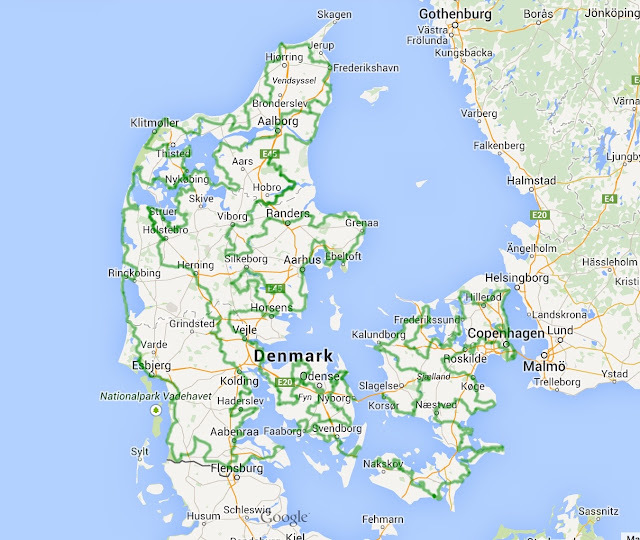 There is a famous route around Denmark taking in all the most spectacular parts and roads outside the major cities, its called the "Marguerite route". It is signposted by small brown signs with a daisy on them, and there are so many you can pretty much spot a sign turn off and enjoy the ride. The total route is about 3,600km and hopefully I'll get to see all of it eventually, but for now its a good way of having random adventures by just chasing daises. Today we headed out to the south west of Jylland which is the western most lump of land making up three major bits of Denmark along with the island of Fyn and the island of Sjælland (where Copenhagen is situated). We rode about 300 kms of country roads skirting the sth east coast almost crossing the German boarder before we decided to head back on a more major road to Kolding. We enjoyed a quick bite to eat in a seaside town of Hejlsminde in the brilliant sunshine which has been pretty rare this summer. I'm sorry I cant publish a map but The GPS is not yet hooked up and quite frankly I'm not sure what roads we took. Did I mention Denmark is flat. Really flat. It was formed buy the leading edge of the ice sheet during the ice age. Consequentially its land forms are basically the dirt wrinkle formed in front of the ice sheet. Its highest mountain (read lump) is only ~270m so twisties in the traditional sense are very rare. It is however undulating and very rural so it is easy to find very entertaining rides only minutes from home.